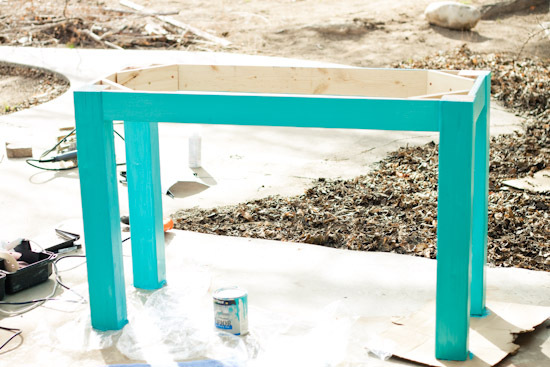 Here is the How-To I promised for the charming and inexpensive desk. If you would also like to do the shelves, go Here to view my past How-To on the craft shelves (the same process and materials were used). 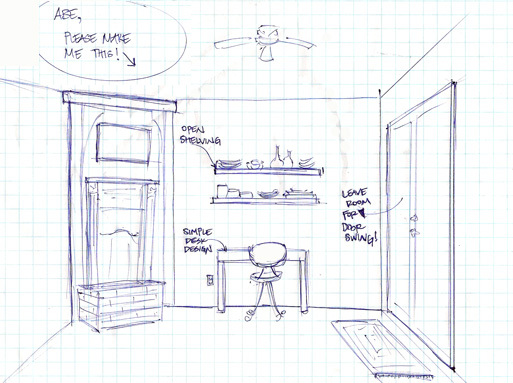 Note: This plan will make a table that is 4' long 30" high and 20" wide. If you need a different size you will need to alter your materials accordingly. Next: Collect materials. 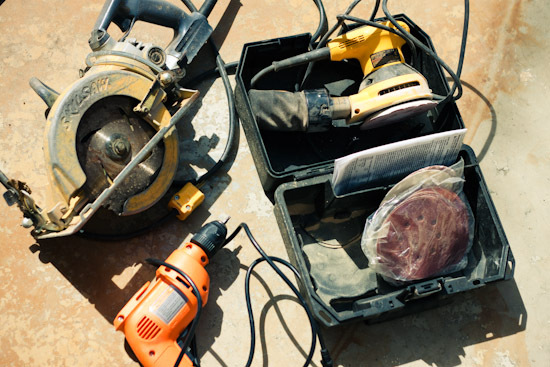 We purchased all of our materials at Lowes but most home improvement stores will have what you need. Step 4: Once all 1"x4" pieces are connected, carefully turn table frame right side up. Make sure that the table frame is square and the legs are plumb. Step 5: Once everything is plumb and square cut 7 1/2" long (short to short) pieces out of the remaining 1"x4" board for corner bracing. Use 1 1/2" screws to attach this brace to each side and one in the middle to the leg. 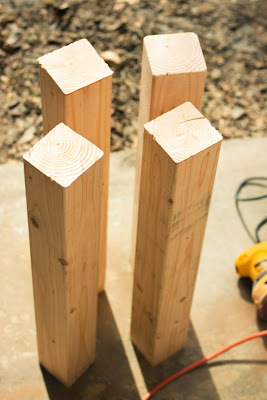 This will keep the table square and help stiffen the legs. Step 6: Run your sander over all sharp edges of the wood (mainly on the bottom of the 1"x4" pieces). It does not have to be perfect since you will be painting it. 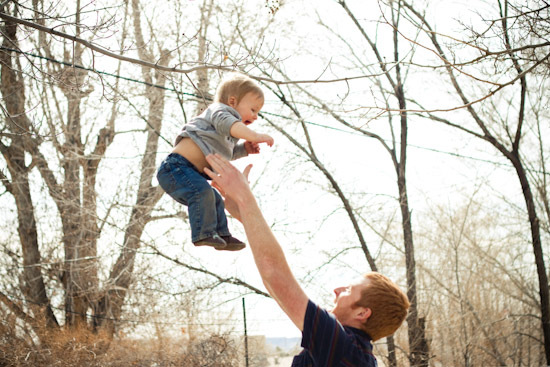 Step 7: Take a break and play with your little ones that are craving some attention. 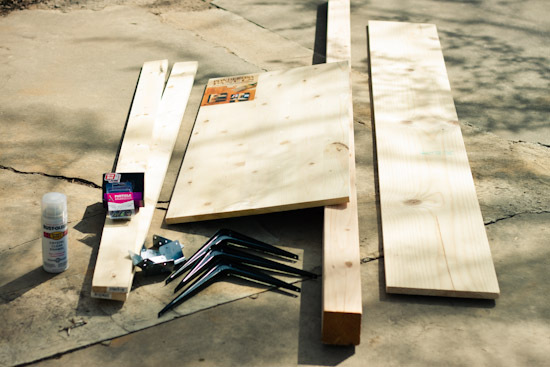 Step 8: Wipe the wood framing pieces down with a dry or slightly damp rag so it is free from all dirt and dust. Now you can apply your paint finish. I used the paint pictured above, its just an interior latex wall paint. 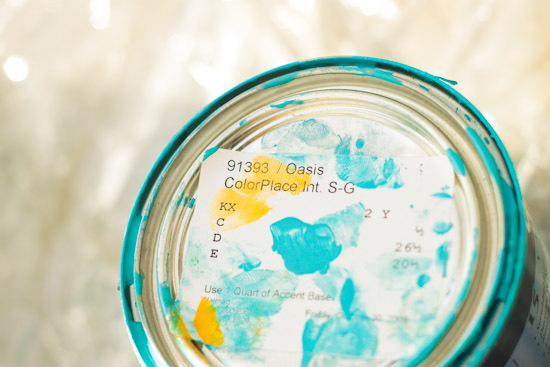 If you want the exact color you can find it at Wal-mart, the brand is Color Place and the color is Oasis. No special techniques were used here, I simply applied 1 coat to cover and then let it dry completely. Step 9: When your paint is completely dry you can use a course grain sandpaper (I think we used an 80) to sand down and distress your wood. This part is fun because the more imperfect the better! Step 10: Sand the 20" x 48" x 1" table top board (Mainly the ends and corners). Start with a 80 sandpaper and progressively work up to 220. 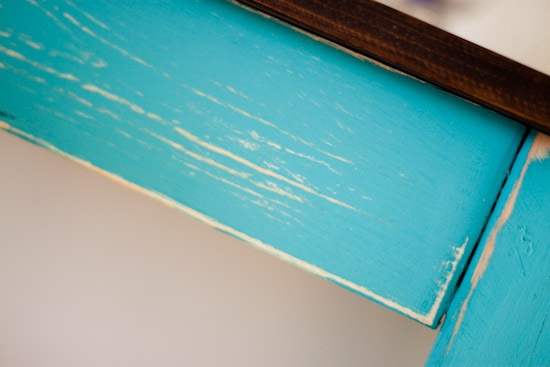 After sanding make sure to wipe down with a dry or slightly damp clothe to remove dust. Step 11: Apply an even coat of stain to your 48"x20"x1" table top. Stain should be applied with a dry rag (cut up old t-shirts work well too!) 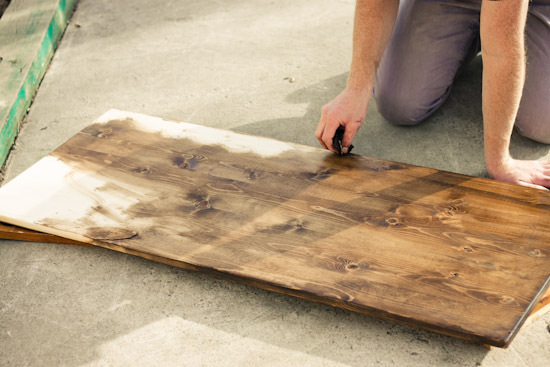 Dip your rag in the stain and apply to board in horizontal movements going with the wood grain. You can apply multiple coats if you like a darker look. We used 1 coat of dark walnut stain by Minwax. Let dry overnight and then spray evenly with clear enamel or some other clear coating. Wait 1 hour. Step 10: Now you are ready to attach the table top to the table frame/legs. 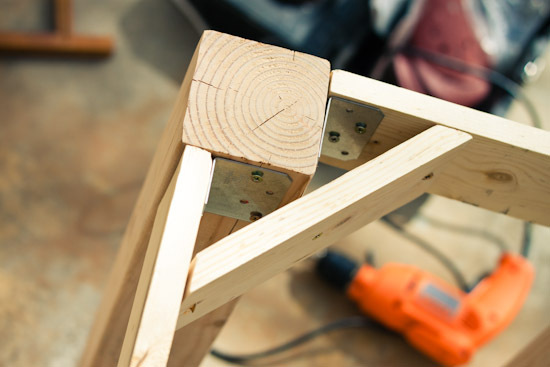 Apply wood glue along the top of the table frame, trying to keep it on the inner portion. 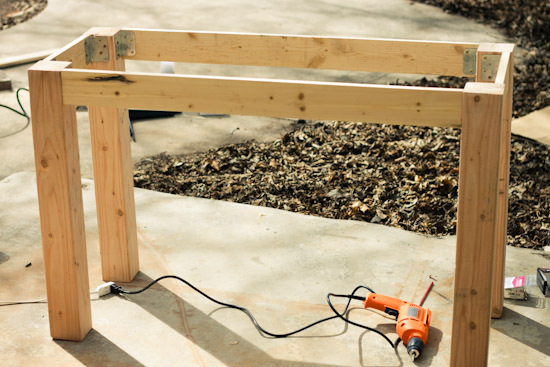 Place the tabletop on the frame and position so that there is an even 1" overhang on each side. Use clamps or something heavy to hold the tabletop down while the glue dries. Read glue instructions for drying times. 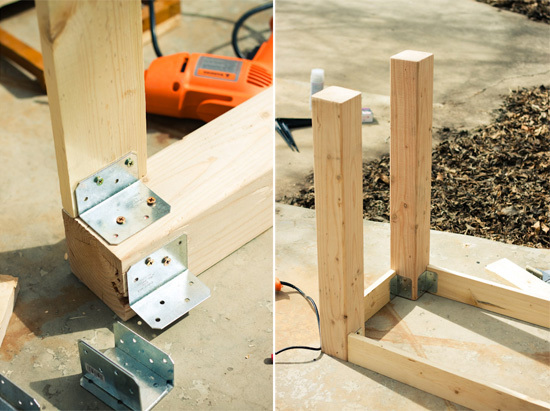 Also use 4 of the same 2"x3" metal angle brackets to attach the top to the frame from underneath. Step 11: ENJOY YOUR NEW TABLE! If you have any other questions please leave a comment and I will do what I can to help. have I told you how impressive you are! Stop it, you're making me look bad! 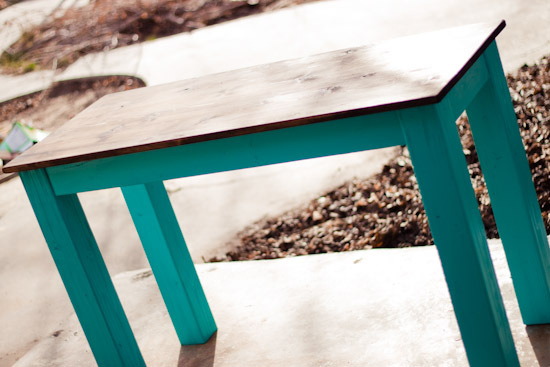 :) Such a cute desk, someday I'll attempt it, the shamrock pretzels are next on my list! I will take one of those. Awesome tutorial! Abe looks so manly. Also, how much did this end up costing? We spent about $40 on the desk materials and $20 for the shelving. But, we splurged a little on the desk top and decided to get a nicer Pine wood for about $20 but you can buy a cheaper top that looks similar for around $10. 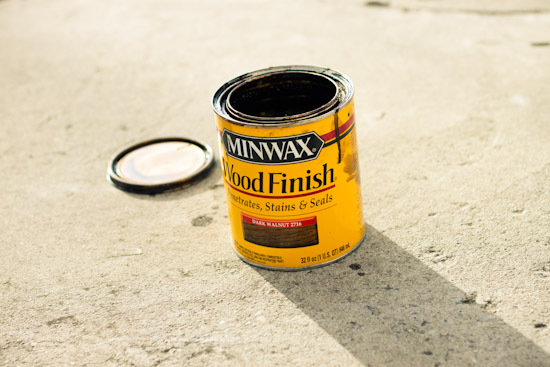 We also already had the paint and stain, but you don't need much of either so you can buy small containers or keep the leftover for future projects. I wonder where he learned to fly? Discovered your tutorial through Pinterest. This is absolutely lovely. Great job and I love the added step to play with the kiddos! I'm looking to make something similar to this and was wondering if you remember about how much this table cost in materials? My husband is out there making this for me right now. :D I'm just waiting on him to finish sanding and cutting so I can paint. I loved the colors so much that I'm using the same colors. Thank you for this tutorial. And, for those asking about prices. We bought everything at Lowe's except for the paint, stain and gloss. We got those three things at Walmart. It cost us about $90. We didn't have any of the screws either so we had to buy both sets. They were about $5 a box for each size. If I wanted a 60" top, would the design scale out or do I need to beef it up? I'm new to the DIY furniture projects, but I am excited to get started. I'm also on a budget for furniture, so I was wondering approximately how much it was to complete? Thank you! Nice table. I'm going to make one. 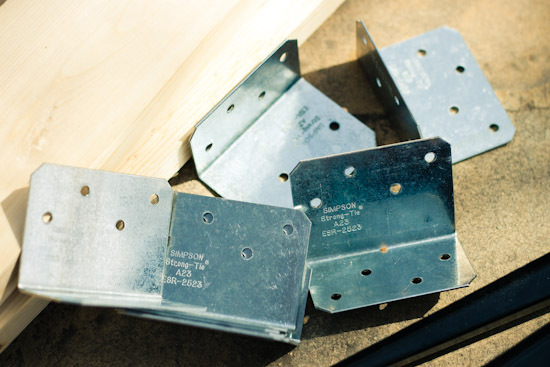 Using a Kreg Jig to drill pocket holes could be a different option rather than using the metal brackets. I want to share an informative thing about cellulite. I truly cherish this old furniture set!VINTAGE FURNITURES It's an incredible impartial shading and I certainly think when I get it reupholstered I'll be staying with a comparative shading. We built this. The modifications I used are as follows. 1. I used cedar wood not pine. 2. I ordered from Home Depot a cedar skinned piece of plywood for the desk top. They delivered it to my house. I like the cedar charqcter of the grain. 3. I skipped the angle braces and screwed the desk top to the base/legs with brackets. 4. I added a piece of trim to the edge of the desk to make it have a more finished look. 5. The desk top I ordered is 24” deep not 20”. My daughter wanted a bigger sized table top. 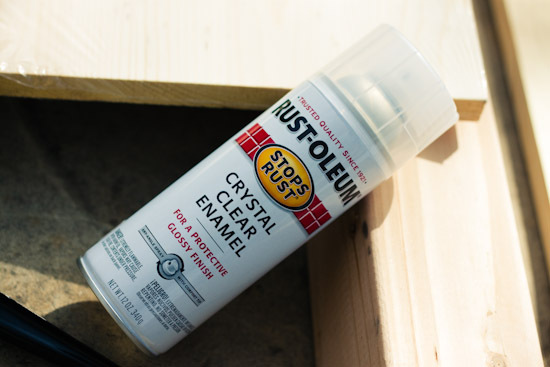 I used a polyurethane coat with brush instead of spray enamel. It takes longer to dry but is a more uniform application and less expensive. Thanks again for posting. For the angle brackets, where would you recommend affixing them to the top of the desk? The loft ought to be an ideal place to prepare a recreation room. This is post is very informative for everyone, Thank you for sharing this post people can get that how can they make a perfect and useful table for living and dinning room. Keep giving updates. I have seen some news about technology development up till now. 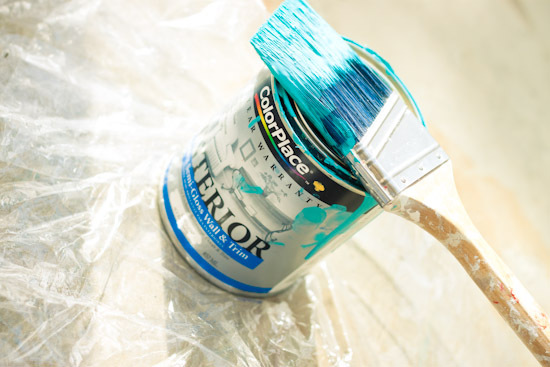 It is amazing when you think about how painting has developed into something made from the growing technology, from only brushes and paint rollers, to airless sprays or paint sprayers. It makes painting easier and fun! Anyway, thank you for sharing this article! It really inspired me to decorate better. Would like to see more updates from you. Perfect Keto Max A worldwide epidemic of diabetes and weight problems has led many people to attempt to shed pounds by weight-reduction plan - however lowered-calorie diets are notoriously tough to keep up. It is no wonder that increasingly individuals who battle with discovering the most effective weight-reduction plan to lose fat and shed those pounds, develop into interested in completely different lose fat weight-reduction plan plans and weight discount packages which might be out there now. Remembering the following simple healthy eating food plan ideas and placing them into follow can result in weight reduction with out the help of any particular eating regimen plans, weight loss applications , fitness books, or medicines. In addition, health food nuts who neglect to embrace better train and dietary patterns will recuperate the shed pounds and probably more. choose the best SEO Company in Delhi,Call @ +919910326510 and get more insights related to charges and other work related terms & conditions.